It isn’t all that often that I am really blown away with changes in technology. Sure, they are cool, interesting and in some cases astounding but something that really blows me away is rare. I can report that I have recently had one of those experiences with my Xbox. Microsoft has just updated the interface on the Xbox to be more Metro like (a la Windows 8) but that isn’t the big change. The big change in my mind is the ability to allow third party apps to be downloaded and installed to the console. It goes to show you how powerful apps concept is in our technology world these days as pioneered by Apple. But even that is not what I found earth shattering. My epiphany came when I installed the ABC iView, SBS on Demand and YouTube apps. The ABC iView and SBS on Demand apps allow you to watch TV from two popular channel here in Australia. This is fantastic but still does have some limited content in what is available. However, it is when I started to look at the YouTube app that my brain exploded. With the YouTube app on my Xbox I can watch just about every YouTube clip right on my TV set! I started with watching some of the clips that I have saved as favourites on my channel. I then moved into looking at what YouTube recommended and then finally trawled through some popular picks including shorts for upcoming movies. I could have stayed up all night watching YouTube (which contrary to popular belief does have some very interesting and engaging content). Think about this for a moment. ALL of the content on YouTube is now available on your TV. You can use the YouTube app to tee up what you want to watch during the day and then come home a play it. You can view all the latest movie trailers on your TV WHENEVER you want. Why would you ever go back to watching normal network TV? Why would you pay for cable TV? The Xbox makes this available ONTOP of all the other great things the Xbox does. Now, also throw into the mix the ability to control and access your YouTube preferences from your mobile device (say an iPad). You can then potentially stream onto your TV or this device as well as you move about. YouTube becomes your personal TV station where you control the content. The possibilities are endless. The possibilities are also endless for Microsoft as it positions one of its devices into the living room of consumers. The one thing that I waiting for is for my DVD services (Quickflix) to become available on the Xbox (HURRY UP). That will give me access to a huge range of movies and TV shows on demand. However, with iView, SBS on Demand and especially YouTube now available for the Xbox I think I’ll be busy enough until Quickflix becomes available. It’s still early days for this but I can see what a potential game changer this is for traditional media businesses. With YouTube you can watch the content just about anywhere you have an internet connection. The integration of the service across devices like the iPad and iPhone but down to consumer devices like TVs is going to open up even more people to viewing the wonders of YouTube. Like I said, if you sit down and think of the possibilities here your head will explode! Yes friends you can get Lync for iPad and iPhone right now. I have downloaded the iPad version and am playing with it as we speak. I recently received an update to my Windows Phone 7. I am now at OS version 7.10.7720.68 but discovered something interesting about this update. Thus, you enter a list of device MAC addresses you want to attach to you Access Point and deny everything else. If the network card attaching to the Access Point doesn’t match something in the list it can’t connect to your WiFi. Then the Eureka moment! I had recently upgrade my Windows Phone 7 firmware and guess what? It had a new MAC address for the WiFi connector. Interesting. When I updated my WiFi Access Point with this new address it could connect again. I am still puzzled why the MAC address of a Windows Phone 7 WiFi adapter would change during a software update? It doesn’t really matter, just have to make sure I remember that the next time my Windows Phone 7 updates. Strange I can’t remember my iPad 2 doing that when it was upgraded to iOS5 recently. Once I had done that the Lync client connected. Microsoft also recently released Lync for Windows Phone 7. You will also note that Lync clients for iDevices (iPhone and iPad) as well as Android are coming soon, before 2012 if you believe the rumours. Being a Windows Phone 7 user I eagerly downloaded the app and installed in on my phone but again I couldn’t seem to connect to Lync online. Same issue as before, you need to update your DNS records as detailed the above KB article. However, again, I couldn’t wait that long so once more I needed to make some manual settings. To do this on a Windows Phone 7 toggle the “Auto-detect services” and enter the following as the “External Discovery URL”https://meet.lync.com/Autodiscover/autodiscoverservice.svc/Root. Chances are you’ll never be “internal” to the Office 365 network so leave the internal one clear for now. Again, once I made these changes I could connect my Windows Phone 7 to Lync Online. Cool stuff. I can’t wait to see the Lync client emerge for the iPhone and iPad devices as this will really open up the market for Lync. As I have said previously, Lync is one of the real selling points of Office 365 and the more places it can be used the better I say. In the past few days there has been a flood of Microsoft apps making an appearance in the Apple Apps store. The first of these is SkyDrive. Microsoft will give you 25GB of free ‘cloud’ storage space (limit of 100MB per file though). With the new app you can access all that information directly from your idevice (iPhone and iPad) as well as Windows Phone 7. This makes Skydrive a very compelling offering when compared to other ‘cloud’ storage offerings like Dropbox and box.net. Microsoft has had a OneNote application for the iPhone for a while but it has now released dedicated OneNote app for the iPad. The difference is quite marked and OneNote on the iPad takes full advantage of the additional screen real estate. It is again a free app but at this point in time you can only work with OneNote notebooks saved on Skydrive rather than something like SharePoint. However, the expectation is that this will change in the near future opening OneNote up to access notebooks on any shared medium. Lync is Microsoft’s ‘unified communications’ solution. Basically, it allows people to install client software and then communicate with each other via chat, video and voice. It also provides the ability to share things like desktops, whiteboards, PowerPoint presentations and more. Microsoft has recently released Lync clients for the Mac as well as for Windows Phone 7. It is also expected that Lync clients will be available for most other mobile platforms by the end of December 2011. Microsoft has recently updated the interface on the Xbox device but it has also released apps for the iPad and Windows Phone 7. The iPad app again makes great use of the medium and allows you to perform a number of control functions on your Xbox (provided it is on). Although in its infancy it isn’t hard to see where this develop is heading. It is not hard to imagine a not too distant future in which you can login to your Xbox remotely and ask it to download movies, save TV shows, etc. There are also very strong rumours that Microsoft will release its Office suite onto the iPad very shortly. There is still apparently a battle going inside Microsoft as to whether delivering Microsoft’s most profitable product to a competitive device like the iPad is such a good idea given that holding it back may drive sales of the ‘proposed’ Windows 8 tablets or whether without Office on the iPad Microsoft Office is losing sales. Personally I’m in the second camp. To me Microsoft is a software company and the more platforms it can makes it software available on the better I say. Time will tell on this score. One of the options available to Exchange 2010, whether online or on site, is the ability to create an archive folder and store emails there. It is possible to apply policies to automatically have items archived to these folders if desired. For most Office 365 plans users receive a 25 GB mailbox which can be shared between the normal inbox and this archived location (when enabled). With the Exchange Plan 2 and E 3 Suite in Office 365 this archive has an ‘unlimited’ capacity. Thus, on these plans you effectively receive an unlimited email box. Have a look at these two screen shots. 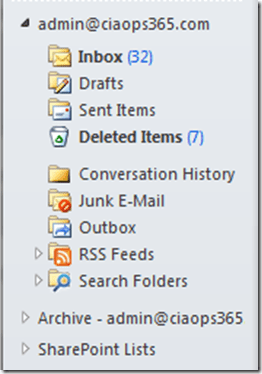 In this second one, note there is an additional item Archive – admin@ciaops365.com. 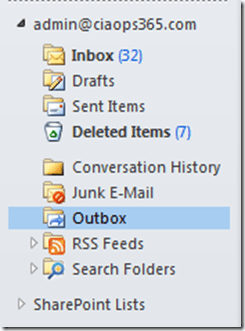 The issue is that these are shots of a connection to the SAME Exchange Online mailbox using Outlook 2010. The first screen shot was with Outlook 2010 from Office 2010 Standard and the second (where the archive mailbox appears) was from Outlook 2010 from Outlook 2010 Professional Plus. You can always view the archive folder using Outlook Web Access but it is a bit of a constraint if you can’t see your mailbox archive via Outlook. The issue is that traditionally only large enterprises used Exchange Archiving and thus they normally had access to Office 2010 Professional Plus. Problem now with Office 365 is that every business utilizing it has access to Exchange Archiving. So how is this going to affect the different plans? E3 suites – because Office 2010 Professional Plus is included as part of the license. Exchange Plan 2 – if sold to a business that doesn’t already have Office 2010 Professional Plus installed. They won’t be able to see their archived email folder (when enabled). Remaining plans – unlikely they will have email archiving enabled as they are limited to 25GB in total spread between inbox and archive (i.e. why do you need archiving when you can put it all in your inbox?). The place it will be an issue is when archiving is enabled. Why would people do that if they can safely store everything in their inboxes as mentioned previously? A good reason that they might want to enable an archive (even on the 25GB max inbox plans) is that they are looking to limit the amount of email that gets synced with the local Outlook via the OST files as archived emails are not cached locally. Now those audiences with the major and minor problems above are probably small but they are still important. Why? For those on Exchange Plan 2 (with the potentially major problem) it is because this is the plan that many will opt for when they start to dip their toes into the ‘cloud’. They will pick Exchange Plan 2 because it provides an unlimited email box size and allows them to attach other products such as SharePoint and Lync as they become more familiar with the ‘cloud’ in the future. Those with the minor problems (most of the other plans with a limited 25GB mailbox) still need to have the ability to configure and utilize archiving, especially to reduce the amount of information they sync with the cloud. In some ways I feel this is something that Microsoft overlooked when it brought the enterprise version of Exchange down to small business. I also don’t believe that it impacts a great audience at this stage but still it is something that Microsoft should address to prevent it being used as ammunition against them and Office 365. Maybe some additional update would be available for installations of Outlook 2010 that connect to Exchange online so they can view the archived emails not matter what version of Outlook 2010 they have on their desktop. Doesn’t seem that hard to do. At worst, maybe a separate version of Outlook for those using Exchange Plan 2 so they can take advantage of the feature? For now it is something to be aware of when working with Exchange and archiving. It is also something to remember affects on site Exchange Enterprise 2010 as well as Exchange Online via Office 365. Is it a big issue? Probably not at the moment but should be rectified as soon as possible to ensure Office 365 continues to grow in acceptance across all businesses, large and small. The biggie here I reckon is the provision of Business Connectivity Services (BCS). This will allow SharePoint online to easily start connecting to external data sources. This should start to open up the flood gates for third party apps to hook into SharePoint. Most interestingly of all is that most of these update have come under the radar, with little fanfare. What it does importantly illustrate is that Office 365 continues to improve and I’ll bet will continue to do so at an even more rapid pace. Part of the Guide has been the inclusion of information around Office 365 since SharePoint Online was part of the Microsoft offering. However, from January 1 2012 things will be changing. From the first of the New Year the Office 365 information in the Guide will be broken out into a new product with a different subscription model and a different offering. More information about this will be announced soon. However, all existing SharePoint Guide subscribers will continue to receive access to the new product as part of their existing subscription as long as they stay subscribed to the SharePoint Guide. This means, that if you have ever thought about being a CIAOPS SharePoint Guide subscriber and if you sign up before December 31, 2011 you will not only receive the SharePoint Guide but also the new Office 365 Guide for the duration of your subscription. After that date you’ll have to purchase each separately. Thus, for $ 299 ex GST up to the end of year you will also get the Office 365 Guide for free. If you want the best information on SharePoint and Office 365, including documents, videos, tutorials, support, etc then you have until the end of the month to sign up for the existing CIAOPS SharePoint Guide. Come January, the Office 365 information produced will only be available with an additional subscription (details to be announced). For all the information about the CIAOPS SharePoint Guide visit – www.wssops.com.